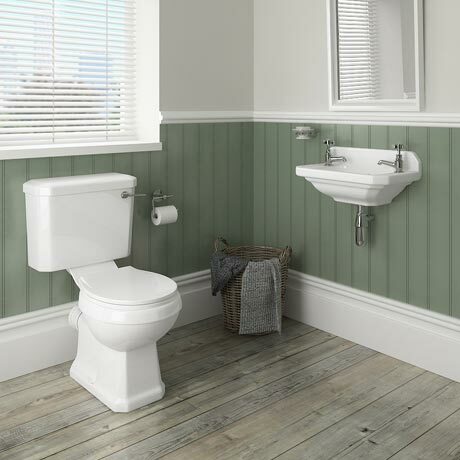 The Carlton traditional toilet is a close coupled traditional WC pan and cistern influenced by classic period design. This traditional toilet is perfect for providing a homely, warm look in any home. A high-quality traditional 2 tap hole wall hung cloakroom basin with overflow, ideal for creating a period look in your bathroom or Cloakroom. Manufactured using high-grade vitreous china ensuring a quality finish and long lasting durability. Bring a touch of elegance and style into your home. Comes with a 5 year guarantee against faulty workmanship or materials. Distance between fixing holes on toilet pan - 150mm. Overall, happy with the finished project. Happy with the toilet and basin, however, the toilet seat is flimsy plastic and the cistern handle is also flimsy - concerns about how robust both will be when in use. Brilliant service and product. Very happy with the service. Exactly as described - delivered quickly and carefully.